This week is anti-bullying week. We will be learning about anti-bullying and the theme of #chooserespect. Respect is one of our core values and we will focus on this throughout the week, celebrating individuality! 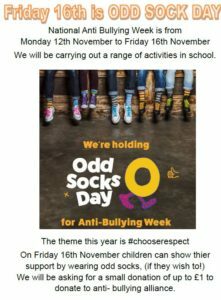 We will show support on Friday by wearing Odd Socks!